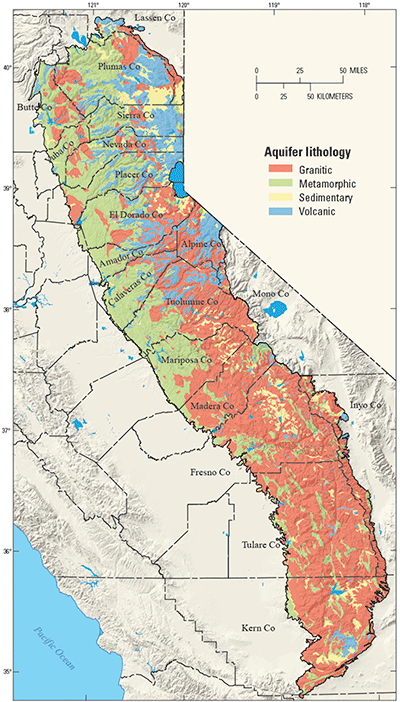 Groundwater provides more than 40 percent of California’s drinking water. To protect this vital resource, the State of California created the Groundwater Ambient Monitoring and Assessment (GAMA) Program. The Priority Basin Project (PBP) of the GAMA Program provides a comprehensive assessment of the State’s groundwater quality and increases public access to groundwater-quality information. The Sierra Nevada Regional study unit constitutes one of the study units being evaluated. 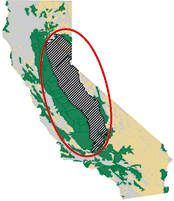 The Sierra Nevada Regional (SNR) study unit covers approximately 25,000 square miles and includes the Sierra Nevada mountain and foothill regions. The study unit was divided into four study areas corresponding to the four major rock types present in the region: granitic rocks, metamorphic rocks, sedimentary deposits, and volcanic rocks (Shelton and others, 2010). In contrast to most other study units evaluated by the GAMA PBP, the SNR study unit consists primarily of fractured-bedrock aquifers. Most of the Sierra Nevada consists of granitic and metamorphic rocks. Groundwater is in fractures in the rocks. The fracture systems may be interconnected or isolated, resulting in variability in water levels, well yields, and water quality on local and regional scales (California Department of Water Resources, 2003). Sedimentary basins contain glacial, alluvial fan, fluvial, and lake sediments. Aquifers composed of different materials commonly contain groundwater with different chemical compositions. The primary aquifer is defined as those parts of the aquifer system tapped by wells and springs listed in the State of California database of public drinking-water supply sources. In the SNR study unit about 25 percent (%) of these sources are springs. Most wells are drilled to depths of 150 to 600 feet, consist of solid casing or a seal from the land surface to a depth of about 50 to 200 feet, and are open or have perforated casing below that depth. Water quality in the primary aquifer system may differ from that in the shallower and deeper parts of the aquifer system. Average annual precipitation ranges from 11 inches at low elevations to more than 80 inches at high elevations, and the majority of precipitation falls as snow. Rivers flowing from the Sierra Nevada provide a large part of the surface water used elsewhere in the State. About 90% of the land in the study unit is natural, and about 60% consists of national forests, national parks, and other federally managed lands. Urban land use is about 5% and is rapidly growing, placing increasing demands on groundwater supplies. The remaining 5% is in agricultural use. Recharge to fractured-bedrock aquifers is mainly from stream-channel infiltration and direct infiltration of precipitation and snow melt. Sedimentary basin aquifers also are recharged by mountain-front recharge at the margins of the basins. Groundwater exits the aquifer system when it is pumped for water supply, flows into streams and lakes, discharges from springs, or leaves areas with a shallow depth to groundwater by evapotranspiration. GAMA’s Priority Basin Project evaluates the quality of untreated groundwater. However, for context, groundwater quality was compared to benchmarks established for drinking-water quality. Benchmarks and definitions of high, moderate, and low relative-concentrations are discussed in the inset box. Many inorganic constituents occur naturally in groundwater. The concentrations of inorganic constituents can be affected by natural processes as well as by human activities. In the SNR study unit, one or more inorganic constituents with human-health benchmarks were present at high concentrations in about 16% of the primary aquifer system and at moderate concentrations in about 21%. Human-made organic constituents are found in products used in the home, business, industry, and agriculture. Organic constituents can enter the environment through normal usage, spills, or improper disposal. In the SNR study unit, one or more organic constituents were present at high concentrations in less than (<) 1% of the primary aquifer system and at moderate concentrations in about 3%. Trace elements are naturally present in the minerals in rocks and soils, and in the water that comes into contact with those materials. In the SNR study unit, trace elements were present at high concentrations in about 11% of the primary aquifer system and at moderate concentrations in about 16%. Arsenic, boron, fluoride, and molybdenum were the trace elements that most frequently occurred at high and moderate concentrations. Antimony, beryllium, cadmium, copper, lead, selenium, and strontium also were detected at high concentrations, but in <1% of the primary aquifer system. Radioactivity is the release of energy or energetic particles during spontaneous decay of unstable atoms. Humans are exposed to small amounts of natural radioactivity every day. Most of the radioactivity in groundwater comes from the decay of naturally occurring isotopes of uranium and thorium in minerals in aquifer materials. Radioactive constituents occurred at high levels in about 8% of the primary aquifer system and at moderate levels in about 20%. Uranium, radon-222, and gross alpha particle activity were the constituents that most frequently occurred at high and moderate levels. Nutrients are naturally present at low concentrations in groundwater, and high and moderate concentrations generally occur as a result of human activities. Common sources of nutrients include fertilizers applied to crops and landscaping, seepage from septic systems, and human and animal waste. Nutrients were present at high concentrations in about 1% of the primary aquifers, and at moderate concentrations in about 3%. Nitrate was the only nutrient detected at high and moderate concentrations. Some constituents affect the aesthetic properties of water, such as taste, color, and odor, or may create nuisance problems, such as staining and scaling. Total dissolved solids (TDS) concentration is a measure of the salinity of the groundwater, and all water naturally contains TDS as a result of the weathering and dissolution of minerals in rocks and sediments. The State of California has a recommended and an upper limit for TDS in drinking water. TDS concentrations were high (greater than the upper limit) in about 1% of the primary aquifer system and moderate (between the recommended and upper limits) in about 3%. Anoxic conditions in groundwater (low amounts of dissolved oxygen) may result in release of naturally occurring manganese and iron from minerals into groundwater. Manganese, iron, or both were present at high concentrations in about 18% of the primary aquifer system and at moderate concentrations in about 5%. Perchlorate is an inorganic constituent that has been regulated in California drinking water since 2007. It is used in solid rocket fuel, fireworks, safety flares, and other products, may be present in some fertilizers, and occurs naturally at low concentrations in groundwater. Perchlorate was detected at high concentrations in <1% of the primary aquifer system and at moderate concentrations in about 1%. The Priority Basin Project uses laboratory methods that can detect volatile organic compounds (VOCs) and pesticides at low concentrations far below human-health benchmarks. VOCs and pesticides detected at these low concentrations can be used to trace water from the landscape into the aquifer system. VOCs are present in many household, commercial, industrial, and agricultural products and are characterized by their tendency to volatilize (evaporate) into the air. Solvents are used for a number of purposes, including manufacturing and cleaning. In the SNR study unit, solvents were present at high concentrations in <0.1% of the primary aquifer system and at moderate concentrations in about 3%. The solvents detected at high concentrations were tetrachloroethene (PCE) and 1,2-dichloroethane. Trihalomethanes can form during disinfection of water supplies and may enter groundwater by the infiltration of landscape irrigation water or leakage of distribution systems. Trihalomethanes were not detected at high concentrations and were present at moderate concentrations in <0.1% of the primary aquifer system. Gasoline oxygenates increase the efficiency of fuel combustion and are used to help meet air-quality standards. Gasoline oxygenates were not detected at high concentrations and were present at moderate concentrations in <0.1% of the primary aquifer system. Other VOCs, including organic synthesis reagents and refrigerants, were not detected at either high or moderate concentrations. Pesticides, including herbicides, insecticides, and fumigants, are applied to crops, gardens, lawns, around buildings, and along roads to help control unwanted vegetation (weeds), insects, fungi, and other pests. In the SNR study unit, pesticides were not detected at high or moderate concentrations in the primary aquifer system. GAMA’s Priority Basin Project uses benchmarks established for drinking water to provide context for evaluating the quality of untreated groundwater. After withdrawal, groundwater may be disinfected, filtered, mixed, and exposed to the atmosphere before being delivered to consumers. Federal and California regulatory benchmarks for protecting human health (Maximum Contaminant Level, MCL) were used when available. Nonregulatory benchmarks for protecting aesthetic properties such as taste and odor (Secondary Maximum Contaminant Level, SMCL) and nonregulatory benchmarks for protecting human health (Notification Level, NL, and Lifetime Health Advisory, HAL) were used when Federal or California regulatory benchmarks were not available. Concentrations are considered high if they are greater than a benchmark. For inorganic constituents, concentrations are moderate if they are greater than one-half of a benchmark. 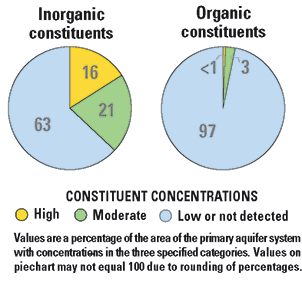 For organic and special-interest constituents, concentrations are moderate if they are greater than one-tenth of a benchmark; this lower threshold was used because organic constituents generally are less prevalent and have smaller concentrations relative to benchmarks than inorganic constituents. 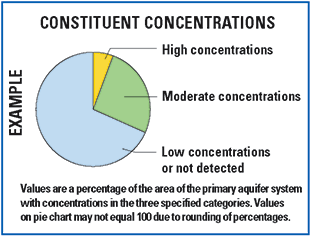 Low concentrations include non-detections and values less than moderate concentrations. Methods for evaluating water quality are discussed by Fram and Belitz (2014). Primary aquifer systems in the SNR study unit are composed of granitic rocks, metamorphic rocks, sediments, or volcanic rocks and have different groundwater quality. These differences in water quality reflect differences in the composition of the rocks and sediments that compose the aquifers, in the occurrence of developed land uses, in the types of wells found in different rock types, and in other factors (Fram and Belitz, 2012, 2014). The sedimentary aquifers have the greatest proportion with high or moderate concentrations of nitrate. Areas near wells in sediments have greater amounts of urban and agricultural land use than areas near wells in other rock types, and thus, may have more potential anthropogenic sources of nitrate to groundwater. The sedimentary aquifers compose 7% of the SNR study unit primary aquifer system, but contain more than 20% of the public-supply wells in the study unit. The granitic and sedimentary aquifers have greater proportions with high or moderate concentrations of uranium than do the metamorphic and volcanic aquifers, reflecting that minerals containing uranium and thorium are typically more common in granitic rocks than in other rock types and that granitic rocks are the dominant source of sediments in most of the SNR study unit. Arsenic was the trace element most commonly present at high or moderate concentrations in all four aquifer systems, and the greatest proportion of high concentrations occurred in the volcanic aquifers. 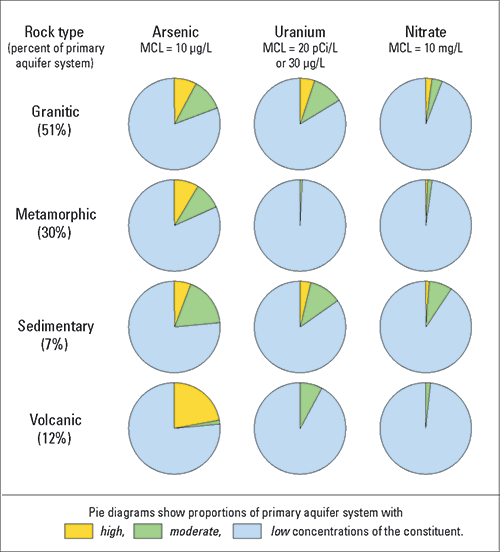 High arsenic concentrations in groundwater in volcanic rocks typically were associated with oxic, high-pH conditions, whereas high arsenic concentrations in groundwater in other rock types typically were associated with anoxic conditions and location in the southwestern part of the SNR study unit where the granitic rocks typically have higher concentrations of arsenic and other trace elements than in other parts of the study unit. GAMA’s Priority Basin Project (PBP) assesses water quality in that part of the aquifer system used for drinking water, primarily public supply. Water quality in shallower and deeper parts may differ from that in the primary aquifer system. GAMA’s Domestic Well Project assesses water quality in the shallower parts of the aquifer system. Ongoing assessments are being conducted in more than 120 basins throughout California. The PBP assessments are based on a comparison of constituent concentrations in untreated groundwater with benchmarks established for the protection of human health and for aesthetic concerns. The PBP does not evaluate the quality of drinking water delivered to consumers. The PBP uses two scientific approaches for assessing groundwater quality. The first approach uses a network of wells to statistically assess the status of groundwater quality. The second approach combines water-quality, hydrologic, geographic, and other data to help assess the factors that affect water quality. In the SNR study unit, data were collected by the PBP in 2008 and from the State of California database for 2006–2008. The PBP includes chemical analyses not generally available as part of regulatory compliance monitoring, including measurements at concentrations much lower than human-health benchmarks, and measurement of constituents that can be used to trace the sources and movement of groundwater. California Department of Water Resources, 2003, California’s groundwater: California Department of Water Resources Bulletin 118, 246 p.
Fram, M.S., Belitz, K., 2014, Groundwater quality in the Sierra Nevada, California: U.S. Geological Survey Fact Sheet 2014–3096, 4 p., https://dx.doi.org/10.3133/fs20143096.